Swaran Kamal, a cash prize of Rs.40,000 and a shawl. 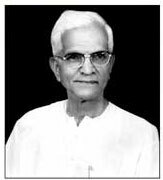 Dada Saheb Phalke Award for the year 1982 was conferred on AKKINENI LAKSHMI VARAPRASADA RAO, popularly known as L.V.Prasad, for his outstanding contribution to the cause of indian Cinema. Prasads films in Hindi, Telugu, Tamil and Kanada have captured the attention of millions of cinegoers throught the country. In Tamil he has produced films like THAYILL PILLAI, IRUVAR ULLAM, IDAYA KAMALAM and PIRIYA VIDAI. In Telugu he has directed films like PALANATI UDDHAM, MANA DESAM, SHAVUKAR, PELLICHESI CHOODU, MISSAMMA, SAMSARAM and MANOHARA in Kannada too, he has produced films MANE BELIGIDA SOSEY and THANDE MAKKALU. Prasad built the Prasad Studios in 1965, and the Colour Film Laboratory with a 70 mm colour processing plant and sterophonic sound recording theatre in 1976. Actively involved in several trade bodies. Prasad is now the President of South Indian Film Chamber of Commerce. He is also a member of the Board of Film Censor.